Is everyone in Australia using a KeepCup yet? The trend continues to grow, and I can't wait for the day when every takeaway coffee I see is in one of this adorable reusable mugs. 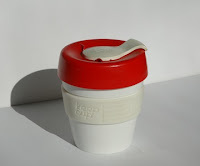 For those of you who may not know, it was takeaway coffee cups that flipped my environmental switch, so every time I see a KeepCup my greenie heart glows. I have two KeepCups; one stays at home, and is a bright and happy cup I created using the Design My KeepCup webpage. It's great motivation to get out for a walk on my work-from-home days. 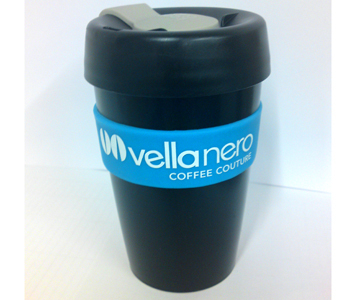 My other cup is from my friend Aileen's coffee shop Vella Nero. Vella Nero was one of the first coffee shops in Sydney to stock KeepCups - so not only do they serve award winning coffee, they care about the environment, too - way to go ladies! Do you have a Keep Cup yet?